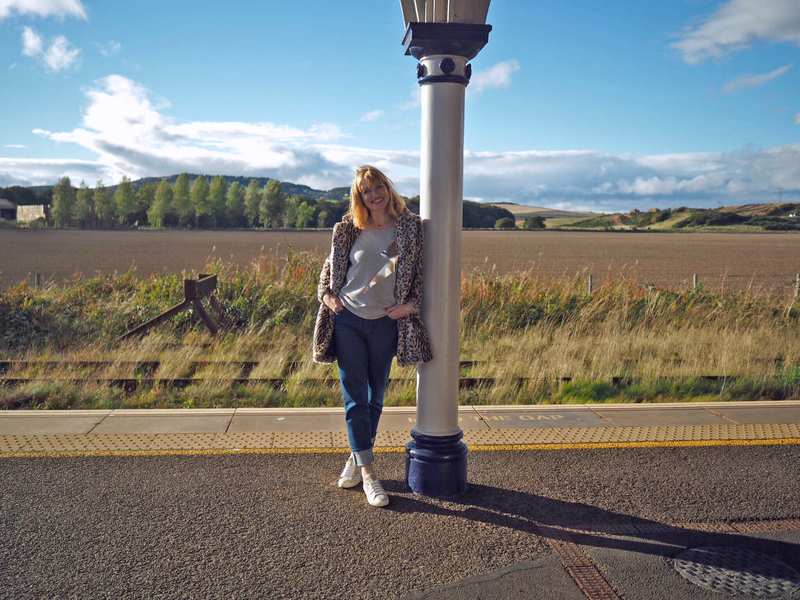 This is the outfit I wore when we went to the St Andrews University Open Day last week. I knew it would be a long day involving travel and a lot of walking so I knew that I needed, above all else, to feel comfortable. 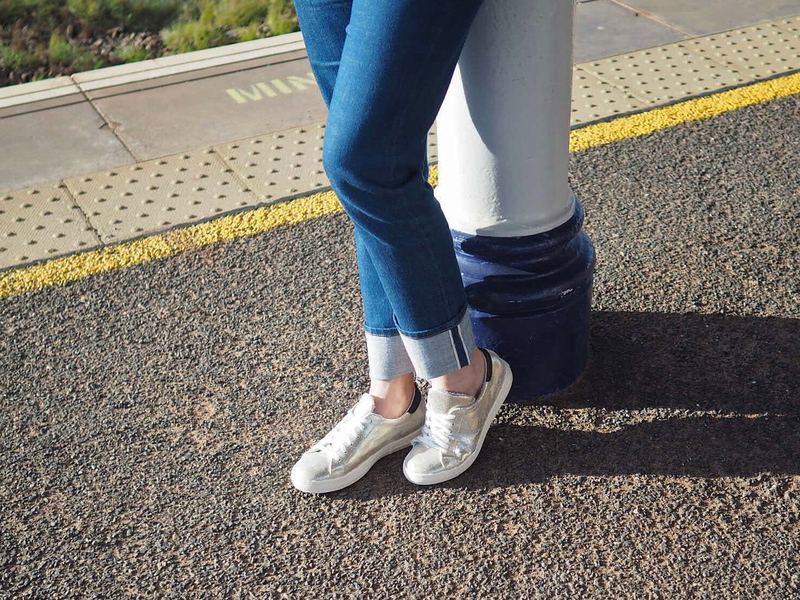 Therefore, I chose simple, practical pieces: jeans, a sweat, sneakers and a coat. But simple and practical is not synonymous with boring. Each item has something special about it. A stylish detail that adds interest and individuality. I said in my previous post that two consecutive trains from Edinburgh to Leuchars, (the station that serves St Andrews), were cancelled, so making us late. What I didn’t say was that our connecting train in the other direction was also cancelled which meant we had a long wait at Leuchars. I loved my outfit and the setting so much that I asked Poppy to do an impromptu photoshoot. I didn’t have the camera lens we usually use for photographing outfits with me, so they aren’t quite as detailed as I’d like, but I think they suffice. I know I’ve said it before, but when the world of fashion announced the return of leopard print, I was really quite surprised. In my book, it’s never been away. I have outerwear, belts and more leopard print footwear than I should admit to, as well as scarves, wrap bracelets and handbags. To me, it’s a timeless neutral that works with everything, from a formal LBD to casual jeans and sneakers. I got this faux fur leopard print coat earlier this year and I’ve worn it over and over. I never tire of putting it on nor of seeing how it elevates a simple outfit. 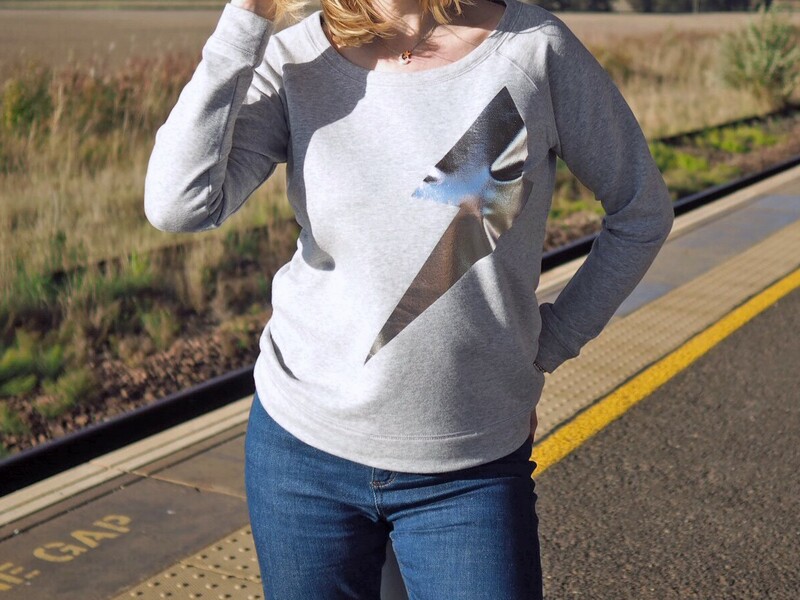 The lightning bolt sweatshirt is a gift from the brilliantly named Love Sweat + Tees. It’s always lovely to receive something new to promote- of course it is- but I’m particularly proud to be raising awareness of this brand. Hayley, the founder set it up after her husband was diagnosed with bowel cancer and 5% of profits goes to Bowel Cancer UK. 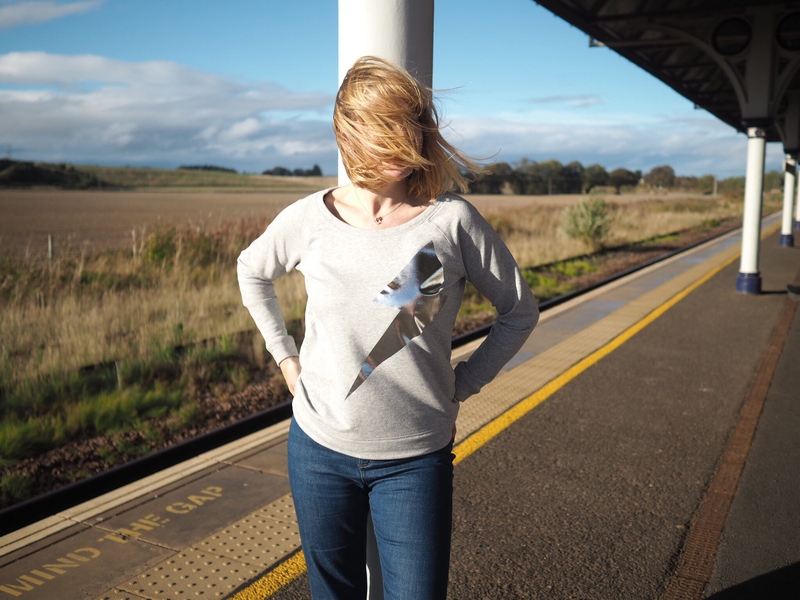 Not only that, the clothing is ethically made from organic cotton and it is printed here in the UK. Please do go and take a look at the rest of the designs and take it from me, it is supremely comfortable. When I’m not wearing a dress, I’m usually wearing jeans. I still love my skinnies but a looser fit is more current and is also more comfortable too. My favourite pair was looking a little tired, so I decided to buy a new pair in the Boden sale. 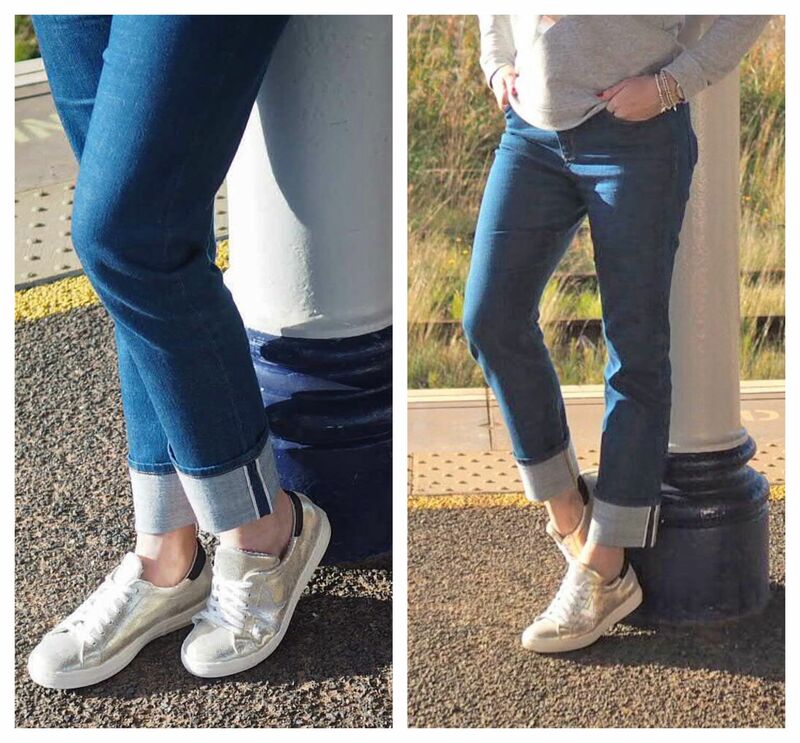 At the time of writing, these Harrogate Girlfriend jeans (fitted at the waist, hip and thigh, looser down the leg), are available in every size and with 30% off too. I love the deep turn-up with its contrasting stitching. 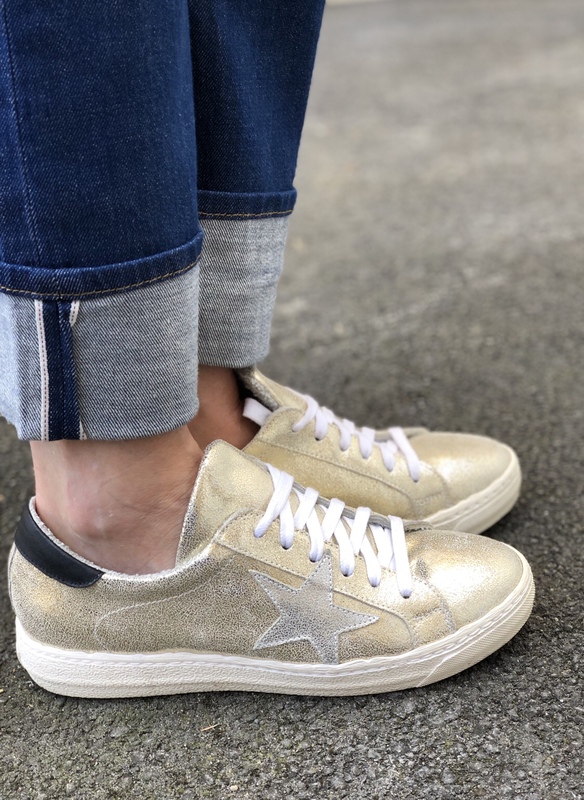 These gold star sneakers sneakers, (trainers, kicks,whatever they should be called), were a much-pondered purchase. I saw them sparkling at me several months ago when I was in a Russell and Bromley store and couldn’t help but pick them up. I could tell immediately that they were beautifully made and would be incredibly comfortable. So I lingered and hesitated… then put them back and walked away. The reasons were several fold. First, they were at a price-point beyond my usual means. Second, I saw them during our long, hot summer. At the time, I couldn’t imagine wearing anything other than sandals ever again. How quickly that changed. Third, there are oodles of similar styles all over Instagram, mainly from one or two brands. They have become ubiquitous among forty-something bloggers. Don’t get me wrong, I like a lot of them. In fact I love a lot of them, I just didn’t want to wear the same thing as everyone else. But, like a schoolgirl crush, I couldn’t get them out of my mind. I kept thinking of all the times it would have been useful to have them and knew that they would be a very useful and worthwhile investment. So I bit the bullet and ordered them. And I absolutely love them. The leather is so soft and the inside is padded and cushioned and absolutely divine. And, as a lover of all things stellate, the silver star is the icing on the cake. My sweatshirt was a gift. Thank you for supporting those brands that support my blog.